Tolerans celebrates 50 years as the leader in in-line stitching by launching a new lateral stitching solution. See the stitcher at World Publishing Expo in Berlin in October 9-11, 2018. The world’s first stitched broadsheet has been produced at Hall Media Tryck AB in Jönköping. Installed at the former, the new stitcher from Tolerans makes it possible to stitch full size formats such as broadsheet and Berliner products inside the press. This innovation creates opportunities for printers to enjoy new revenue streams, cost savings and production efficiency. The first Tolerans FLOWLINER Former was installed and tested at Hall Media Tryck in Jönköping, Sweden in September 2018. It is integrated into a KBA KF 80 folder at the former. The new lateral stitching solution means that full-size formats such as broadsheet and Berliner products can be stitched in-line. “We have delivered 2,000 cross-web stitching solutions for newspapers and commercial print around the world over the past 50 years. 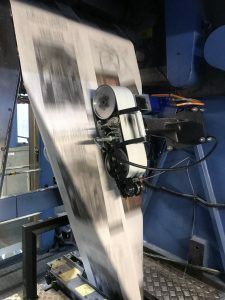 Our new lateral stitching solution creates a whole new opportunity for cost-effective stitching, allowing broadsheets and Berliners to enjoy the same advantage as tabloids for keeping the newspaper together,” Melin adds. Tolerans will exhibit in hall 21a, stand number E.14 during the World Publishing Expo in Berlin in October 9-11, 2018.